Use the PPro8 Order Status window look up the status of your orders. 1. On the PPro8 toolbar, click OrderStatus. 2. The Order Status window appears. 1. Click the (All) menu for each parameter you want to filter by, and then click an item. 2. Type a symbol, and type or click a time you want to filter by. 3. The Order Status window shows the status of orders based on the filters you set. Use the color customization function to change the color of orders by status, whether accepted, filled, cancelled, executed, or rejected. 1. Double-click a color box for the order status type you want to change the color for. 4. The new color is set. To select multiple orders, use Shift + Mouse Click. Use the Order Status Inquiry Window to view detailed information about each order, and search through orders by order number, gateway, and client order ID. Double-click an order to open the Order Status Inquiry Window. Or, click OSI. 1. In the Order Status Inquiry Window, click the Market or Gateway menu to show order status by market or gateway. 2. Type or paste the Order Id or Client Order Id in the respective field, and then press Enter, to show order status by order ID or client order ID. 1. To freeze a snapshot of the Order Status window at any time, click Freeze in the Order Status window. 2. To unfreeze the Order Status window, click Unfreeze. 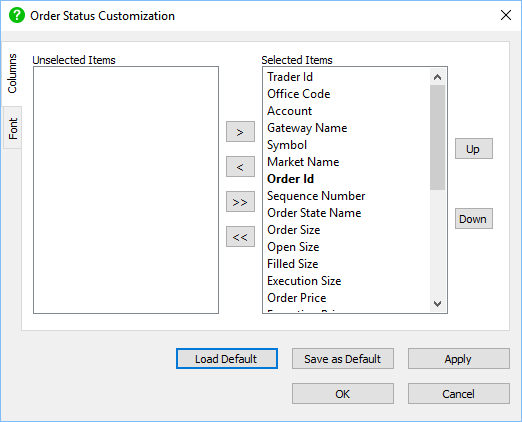 To make changes to the Order Status settings, right-click anywhere in the Order Status window, and then click Order Status Customization to open the Order Status Customization Dialog window. Or, click Ctrl + O. This window displays two tabs on the left: Columns and Font. Use the Columns window to show or hide items in the Order Status window. 4. The item is hidden from the Order Status window. Use the Font window to set the overall font for the Order Status window. 5. In the Order Status Customization window, click OK.